Some 504 Palestinian prisoners are serving life sentences in Israeli jail, Quds Press reported yesterday. In a statement, the Palestinian Centre for Palestinian Prisoners’ Studies said most recently life terms were handed down to brother Nasser and Akram Badawi from the occupied West Bank city of Hebron. The pair was also fined 60,000 shekels ($17,000) after they were accused of shooting an Israeli soldier and wounding others. According to the statement, this is the eighth life sentence that has been issued against Palestinian prisoners this year. 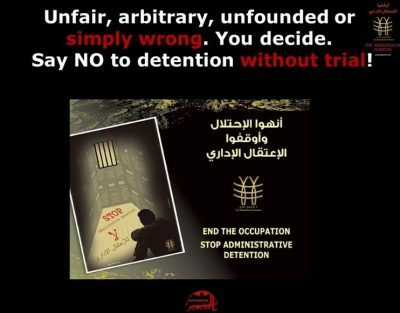 Life sentence, the statement stated, is a 99-year-prison-term that the Israeli occupation imposes on Palestinian prisoners who are accused of killing Israeli settlers or soldiers. It is also imposed on Palestinians accused of planning or directing resistance actions that led to the death of Israelis. Rights groups said that more than 6,500 Palestinians are currently being held in 22 Israeli prisons, including 350 children, 57 women and about 700 under administrative detention. 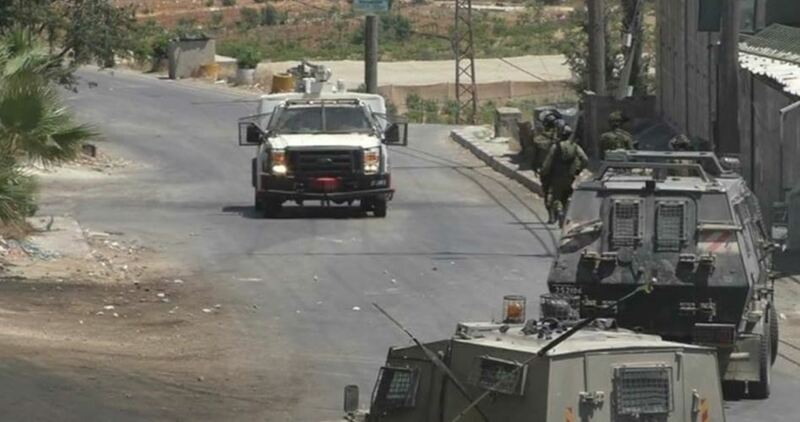 Israeli occupation forces raided several West Bank cities and villages over night and arrested 30 Palestinians. An Israeli tourist exhibit has launched an app which allows visitors to Jerusalem to virtually destroy Al-Aqsa Mosque and replace it with a Jewish temple, furthering the government’s stated commitment to dismantle the Muslim holy site. The smartphone app is part of a government funded exhibition entitled “The Western Wall Experience”. When the app is pointed towards the mosque compound, it makes the Dome of the Rock disappear and replaces it with an image of a Jewish temple. This allows visitors to “to pose for a souvenir photograph” in an imagined landscape where the Muslim holy sites have been destroyed. The app is also sponsored by the Zionist group Aish Hatorah, whose founder Rabbi Steven Burg, tweeted pictures of how the temple appears on the app. Live picture of the Kotel using the Aish HaTorah Western Wall Experience app. One day soon…. Burg is also the former director of the Simon Wiesenthal Centre, a Los Angeles-based Israel lobby group which is building a “Museum of Tolerance” on top of one of Jerusalem’s oldest Muslim cemetery, expected to open in 2018. Israel has continued to perpetuate the myth of the existence of a Jewish temple at the site of Al-Aqsa Mosque, despite archaeological evidence to the contrary. It has used the search for the alleged temple to justify excavations under the Noble Sanctuary, weakening its foundations. Government funded extremist groups, such as the Temple Movement, have already made detailed blueprints in preparation for the building of a Jewish temple. Hundreds of settlers regularly storm the Al-Aqsa compound in coordination with Israeli forces, performing ritualsand pledging to destroy the mosque, whilst Muslim worshippers are left outside. Last month, Israel also announced that it would follow the US and prepare to leave the UN cultural body UNESCO, after complaining repeatedly of the organisation’s allegedly anti-Israeli resolutions. UNESCO has endorsed the Palestinian right to several sites in the occupied territories on multiple occasions, and last year voted in favour of a resolution that denied any connection between Al-Aqsa Mosque and Judaism. The Palestinian Prisoners Society (PPS) has reported, Thursday, that the Israeli authorities have issued Administrative Detention orders against 24 Palestinian political prisoners, including one woman, since the beginning of this month, holding the detainees’ captive without charges or trial. The PPS stated that the female detainee, Bushra Tawil, from al-Biereh city, received a six-month Administrative Detention order, and that she is a former political prisoner, who was abducted and detained by the army, and was re-arrested on November 1st. It added that ten of the detainees have received these orders for the first time, or were former political prisoners, who were arrested again and placed under Administrative Detention. Fahmi Hussein Zohour, from al-Biereh, six months (renewal). Fayez Salah Halabi, from Salfit, six months (renewal). Morad Mohammad Zaghari, from Bethlehem, four months (renewal). Sa’ad Hasan al-‘Amour, from Bethlehem, four months (renewal). Nadim Ibrahim Sabarna, from Hebron, four months (renewal). Nader Mustafa Sawafta, from Tubas, six months (renewal). Ahmad Salim Sufan, from Ramallah, three months (renewal). Wahid Hamdi Abu Mariya, from Hebron, four months. Mohammad Sami Ghneim, from Jenin, four months (renewal). Ahmad Abdul-Aziz Mubarak, from Ramallah, four months (renewal). Omar Mohammad Hamed, from Ramallah, three months. Mahdi Jamil ‘Orouq, from Jenin, four months (renewal). Bassel Salama al-‘Ayasa, from Bethlehem, six months. Mohammad Suleiman Hreizat, from Hebron, four months (renewal). Ayed Mahmoud Doudin, from Hebron, six months (renewal). Ahmad Adnan Salman, from Nablus, four months (renewal). Jamal Mohammad Abdul-Kamel, from Bethlehem, three months (renewal). Ismail Khalil ‘Oleyyan, from Bethlehem, six months. Bushra Jamal Tawil, from Ramallah, six months. Qassam Majd Barghouthi, from Ramallah, six months. Shadi Mohammad al-Hreimi, from Hebron, three months. Ra’fat Na’im Abu ‘Aker, from Bethlehem, six months. Eyad Hosni Bzeigh, from Ramallah, six months. Ribhi Sa’id al-Ashqar, from Ramallah, six months. 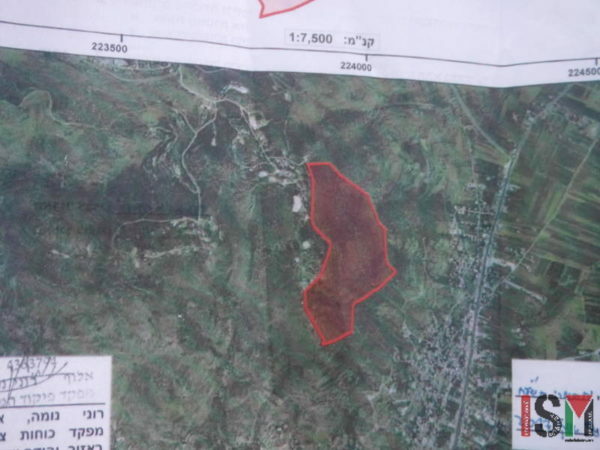 Israeli settlers of Yitzhar set fires in two places, in Palestinian olive fields around their illegal outposts, and attacked a group of farmers a day later, under the eyes of around 30 border police present at the site. 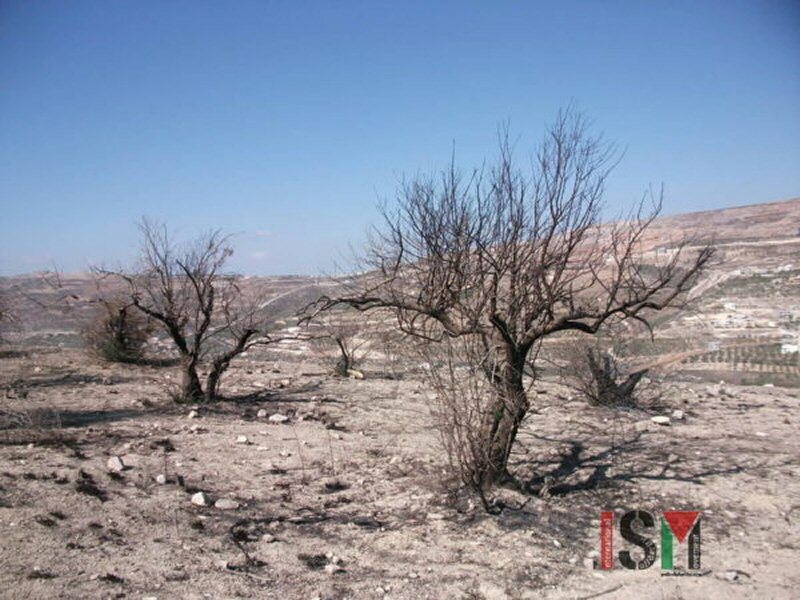 On Sunday, 5 November, at about 10 o’clock in the morning, ISM activists saw smoke coming from olive fields on both hillsides, underneath an outpost of Yitzhar, the illegal settlement south of Nablus, built on the Hill between the Palestinian villages Huwarra and Burin. It wasn’t the first time this has happened. 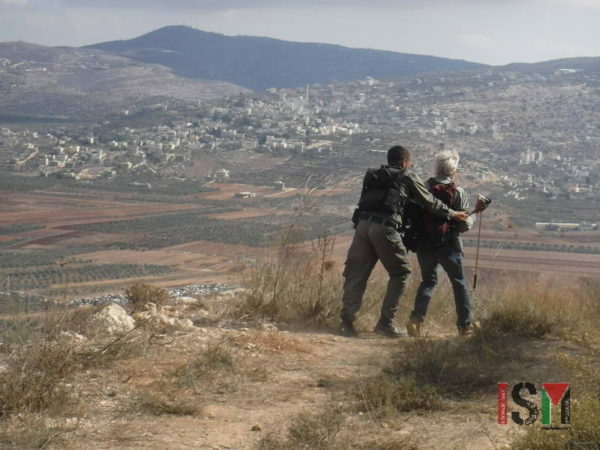 Since the expropriation of the farmland of Huwarra, Burin and Madama, and the illegal creation and steady expansion of the Israeli settlement Yitzhar, violent settlers do anything they can to harm the Palestinian farmers and families, without any risk of being punished for these crimes. A farmer from Burin, whose olive field was set on fire, explained to us that the settler group chased him and his two companions and that they managed to escape. 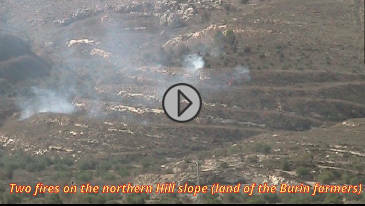 The Palestinian Fire-brigade of Burin waited for permission from the Israeli authority to extinguish the fire, which they apparently did not get. Israel is authoritative for the security in Area-C, and should, instead of blocking the Palestinian Fire brigade, fight any fire in Area-C themselves, which it has not done in the 25 year since this authority was agreed on, in the Oslo accords. 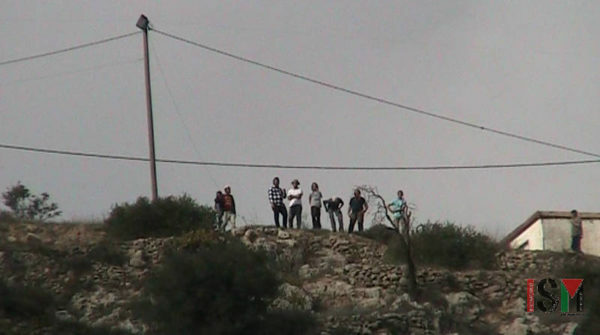 Instead of this, we saw border police, settler security and the settlers side-by-side, in the illegal Hilltop outpost, looking at the burning fields. The next day, 6 November, 2017, at 8:30 AM, a group of nine settlers tried to attack farmers and workers who had official permission of the Israeli security authority, to harvest and cultivate the fields of the Owda family, which was partly burned down the previous day. The large group of border police refused us entrance to the the area, which apparently was declared a closed military zone. The commander showed us the declaration on a paper, which didn’t show many details. Instead of assisting the farmers, we could only be remotely present and filmed the situation from a distance. 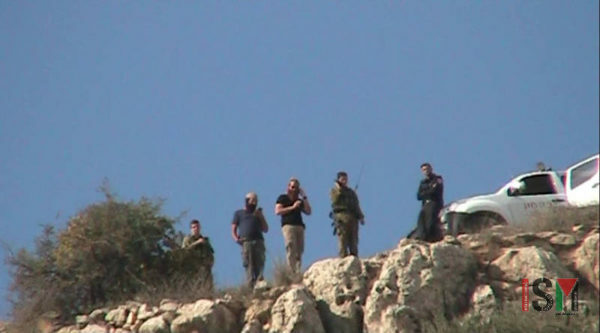 We again witnessed a close cooperation between the settlers, the settler-security and the border police. The threat of an instant attack was constantly felt that day. 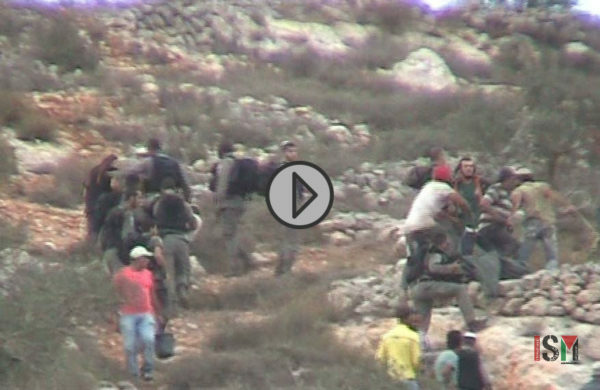 At around 14:30, a group of around 20 settlers attacked the farmers, and most border-police did little to avoid it and arrested none of the settlers. Instead it commanded the farmers to stop their work and quickly leave their land. Settlement outposts are illegal, even by Israeli law, although that law may change one day. In February 2017, the Israeli Knesset passed a new law to legalize all 4,000 illegal outposts. But, the High Court had concerns and postponed the implementation in August 2017. However, if that law ever comes to reality, it would accept these 4,000 outposts as new settlements ready to expand, and would give legality to the expropriation of more private Palestinian land, in a clear violation of the Oslo Agreements of 1993. Israeli occupation authorities are preparing to move number of Palestinian detainees from prison cells to tents, Israeli media revealed, citing a bill proposed by the Israeli Minister of Internal Security, Gilad Erdan. Israeli TV Channel 7 said, according to Days of Palestine, that the proposal is one of the solutions that the ministry is considering, to overturn the implementation of a High Court ruling on the issue. In the middle of June, the Israeli High Court ruled that occupation authorities had to find alternatives to mitigate the overcrowding of Palestinian inmates in Israeli jails. The High Court’s ruling came in response to a petition filed by several Israeli human rights organisations, in which they demanded increasing the cell space for each inmate to four square metres. Currently, each cell in the Israeli occupation prisons is less than three-square metres, including bed and bathroom. The newspaper compared the space in the Israeli prisons to that space in the European prisons, stating that each prisoner in the European prisons has a space of 8.8 square metres. Some 6,500 Palestinians are currently held in Israeli jails, 57 of whom are women while 350 are children, according to the Palestinian Committee of Prisoners’ Affairs. The European Union (EU) announced the intention to send a high-level diplomatic mission to the region to hold talks about the deployment of the EU force at Rafah crossing with Egypt. The spokesman stated that the role of the EU mission is going to be confined to facilitating freedom of movement for the people of Gaza. 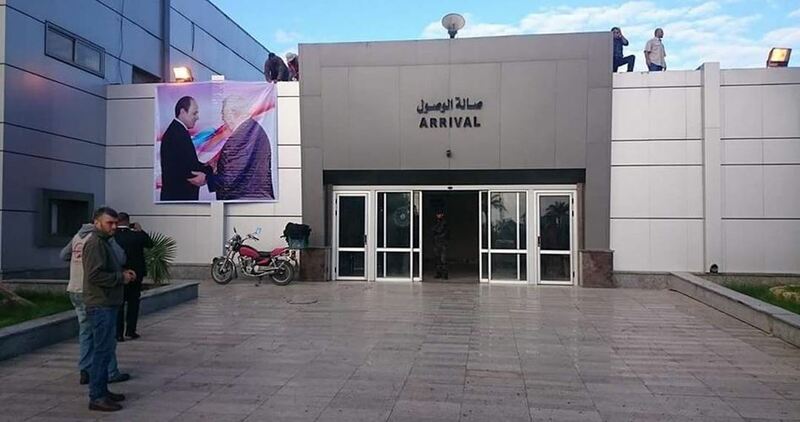 Based on the 2005 Movement and Access Agreement regarding Gaza crossings, the EU is ready to deploy a force at the Rafah crossing to monitor the movement of Palestinians in and out of the Gaza Strip, he added. “We expect all Palestinian factions to work together in good faith towards that goal”, the EU spokesman concluded. Israel’s military forces are expected to end on Thursday a round of air drills, believed to be the largest of their kind in years. The military maneuvers kicked off on November 5 under the “Blue Flag” tag. Hundreds of pilots and front-line fighters from the US, Greece, Poland, Germany, France, Italy, and India have taken hundreds of warplanes to Israel’s airspace in the two-week multinational drills. Observers from 40 nationalities have also been in attendance. The entire drill is based at the Ovda Air Base north of Israel’s Red Sea town of Eilat. The forces are put through increasingly difficult war scenarios each day to test particular skill sets. 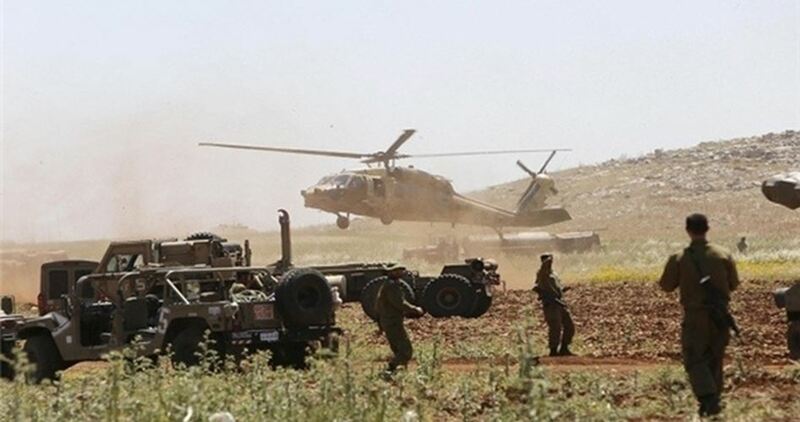 The Israeli army has claimed that the drills provide a sort of battle lab in which forces can hone a spectrum of skills needed to combat growing threats. Two Palestinian boys were kidnapped by the Israeli occupation forces on Thursday evening from Jerusalem’s eastern town of al-Tur. According to eye-witnesses, Israeli forces stormed al-Tur and kidnapped 11-year-old Tamer Hadara, along with another minor. 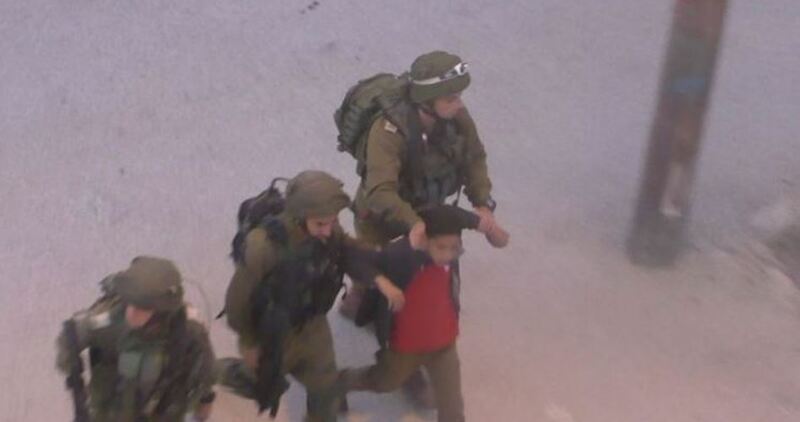 Earlier in the day, 13-year-old Mohamed Shweiki was kidnapped by the occupation forces after he was aggressively beaten on his way to school. The child was later released on conditions of a 10-day house arrest and a bail. Over recent years, hundreds of Palestinian children have been kidnapped by the Israeli occupation army and police under the pretext of stone-hurling. Several minors have also been made to endure exhaustive questioning so as to force confessions. A Palestinian lawyer was detained after attempting to report a settler attack in a police station in occupied Jerusalem. Haaretz Hebrew newspaper said the lawyer Tariq Barguthi headed to Ma’aleh Adumim police station last Tuesday to fill a complaint against a number of settlers who brutally attacked him along with his friend. The policewoman, who took his report at the police station, quickly shifted to questioning him about municipal taxes he allegedly owed and issued him a court summons, the paper said.